Thanks for taking a little time with me today. As the new year, and this new blog, take shape, I want to take a glance at some of my events from 2018. I thought I’d share ten of my favorite images from Beth and Duggan’s wedding in September (okay, small lie, it’s eleven photos including the header). I hope you will enjoy them as much as I have! Beth and Duggan were married in a small and simple ceremony at Beth’s parents’ home. That’s not to say the event wasn’t well thought out; Beth shared her love of spreadsheets with me early on in the planning process (a woman after my own heart). The data collection aside, Beth and Duggan were still incredibly laid back and had such a go-with-the-flow attitude the entire day. I’m so glad I was able to be present for the joining of their families, especially knowing how meaningful this official union was for Beth, Duggan, and Duggan’s son. I’ve shared my ten favorite photos from their wedding and some quick reasons I’ve chosen to highlight them. 1. Beth’s veil laid out on the bed as she gets ready. This is an easy one, as I’m a huge sucker for detail. 2. Sometimes, the less formal images in the bridal suite can have a more intimate feel than any images taken outside. Beth looks like an absolute bombshell here while she waits for the First Look. 3. It is so clear that Duggan’s son is a huge source of light for these two. He played an adorable part in the couple’s First Look, serving as a lookout over Duggan’s shoulder (which also gave him dibs on seeing Beth)! 4. 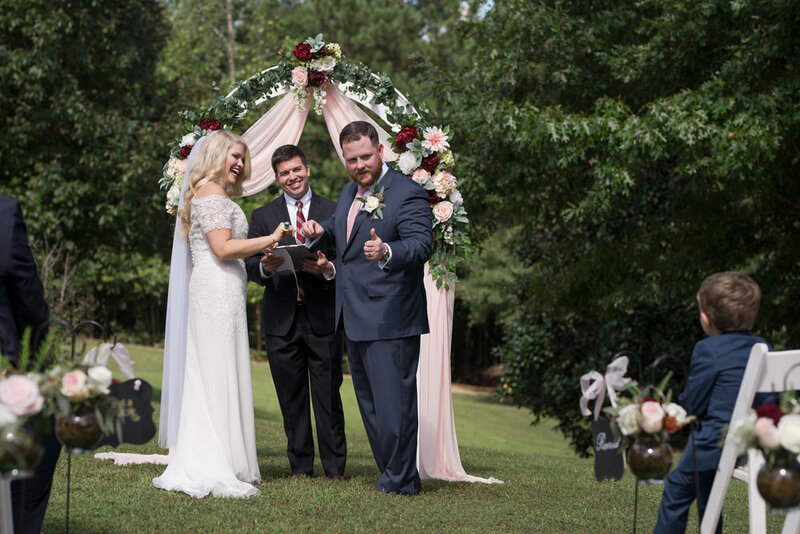 While shots of the ceremony are always lovely, sometimes the excitement of officially tying the knot will show so clearly on the newlyweds’ faces. If you look closely, you can spot the Ring Pop ring on Beth’s right hand. 5-8. Both of the sets of images that follow showcase the effectiveness that a simple focus change can have on a pair of images. I always enjoy playing with that perspective. 5 & 6. I find the use of mirrors and windows highly effective; not only does it create a beautiful effect, but it’s a great workaround for small spaces. 7 & 8. Beth’s mother looking on during the Father Daughter dance. 9. We were able to convince Beth and Duggan to sneak back over to the ceremony arch once the reception had begun. This image is such a testament to the importance of getting some photos in a less crowded setting. When the two were able to spend some time alone, it became clear that they were absolute goofballs. It was so rewarding to get to capture some of that for even a few minutes. 10. You can see such tender moments between parents during the wedding festivities, and this is no exception. Beth’s mom was responsible for putting together most of the day. 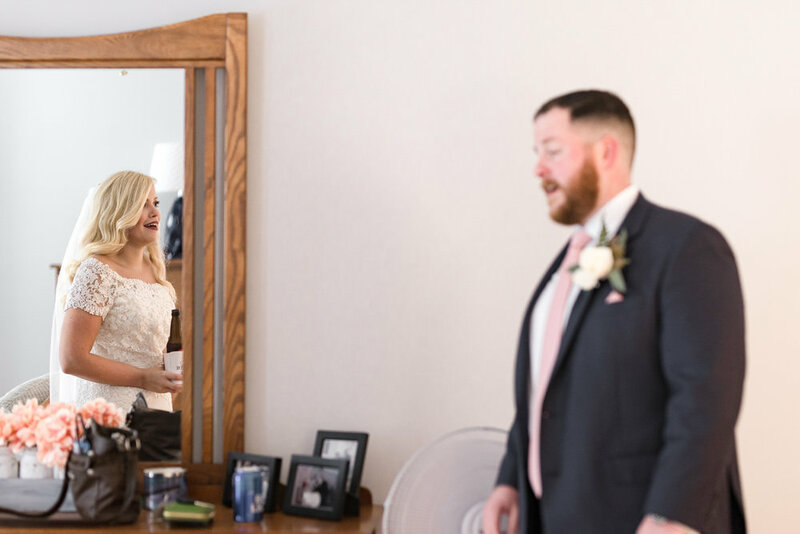 She was so on top of everything leading up to the wedding, and this was a second for everyone to appreciate the love and effort that had been put into Beth and Duggan’s special day. There is such pride from Beth’s father as he looks at his own bride. That’s all ten! Thanks for taking a look through some of my favorite shots from this sweet and intimate at-home wedding. If you’d like to see more of my favorite wedding images, head over to the Wedding Gallery and take a look. Which image is #1 for you? Let me know in the comments!